For the uninitiated geocaches are hidden log books which people go out and find using GPS. Geocaching is going out and looking for geocaches. Anyone can do the hiding and anyone can do the finding. All you need is a GPS device (i.e. any smart phone). Geocaches come in all shapes and sizes and can be hidden anywhere from tiny scraps of paper inside magnets and attached to road signs to large boxes that require a tree climb to retrieve. With just 340 finds (at the time of writing) in two years we are by no means an authority on geocaching. We have had a bit of experience with caches of all types. It’s completely addictive, I would recommend to anyone that they give it a go. Geocaching will get you out and about – We can sometimes be a bit lazy, geocaching got us motivated to go out for walks. In the early days we were off somewhere new nearly every day. We don’t have a dog and this is the next best thing. You’ll get to know your local area better – Most geocachers start their adventure from home. We’re lucky enough to live in a geocache hot spot with several active cachers and more than 50 caches just in our small town. Looking for caches has led us down footpaths to places we would never have found otherwise. Achievement – The sense of achievement on finding a difficult or well-hidden cache is brilliant. It really is quite a buzz! Adventure – It’s not just at home, wherever you are there will be caches nearby. This will lead you down paths or streets you would never have thought to go down. It shows you the place you are visiting from a new angle. Education – Many caches are just for fun but many more have something to teach you. Often these caches will be placed in places with historical significance. These might be obvious (like a church or monument) or unseen (like a train station or building that is no longer there). Using your brain – Many of us forget to do this sometimes. Some caches require a bit of extra brain power to work out their location and some require A LOT. As well as traditional caches there are also multi and mystery caches neither of which give you their exact location, it’s up to you to use the clues provided to work the co-ordinates out. Multi-caches are usually worked out from clues on the ground. Mystery caches on the other hand are usually worked out at home before you set off. Some are fairly easy, some are almost impossible. This cache is my nemesis. Don’t let these put you off having a go! It’s addictive – You find yourself checking your stats everyday and trying to work out if you can fit a quick cache-trip in before family parties. Yes, you might have seen me digging around in the undergrowth in heels and a smart dress before (only joking, I don’t wear heels). Once you have the scent of a cache you can’t let it go – This can leave you spending a lot of time in some odd places. It might be that in an urban area you spend far to long examining every inch of a piece of street furniture. It’s gone past the point where you are attracting odd looks from passers-by (muggles in geocaching speak). You feel like the authorities might turn up any second to challenge you. 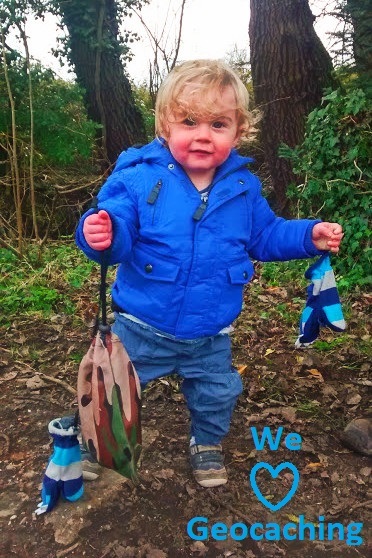 The kids – We think Geocaching is great for kids for all the same reasons it’s great for adults. However, we have had some problems with Ted over the years. Boredom – Being expected to stand in one place for an indeterminate amount of time while mum and dad’s attention is completely elsewhere! Cue complaining and whining. Long walks – The usual problems. A three year old’s legs do not work for more than 30 seconds. Unless there is a playground and/or race involved. Parting with the cache – As soon as we’ve found the cache suddenly becomes very possessive of it. He either wants to take it home or hide it somewhere else (definitely not allowed). The toys – Most large caches have swaps in to make geocaching more attractive to kids. The toys are usually broken, plastic crap and pretty grotty. Ted will always find something horrible that he suddenly can’t live without. Accessibility – Most caches are placed along lovely country walks and footpaths. The sort of places that are impossible to get to with a pushchair. We always have the buggy so we’ve lifted it over styles, pushed it along busy roads and through mud. If you’re not sure if it’s for you or not I urge you to give it a go. The app is free and it’s not that expensive to upgrade to the premium if you find you’ve got the bug. Find out more on the geocaching website. Have you thought about geocaching before? Have we inspired you or put you off? What are you experiences of geocaching with kids?